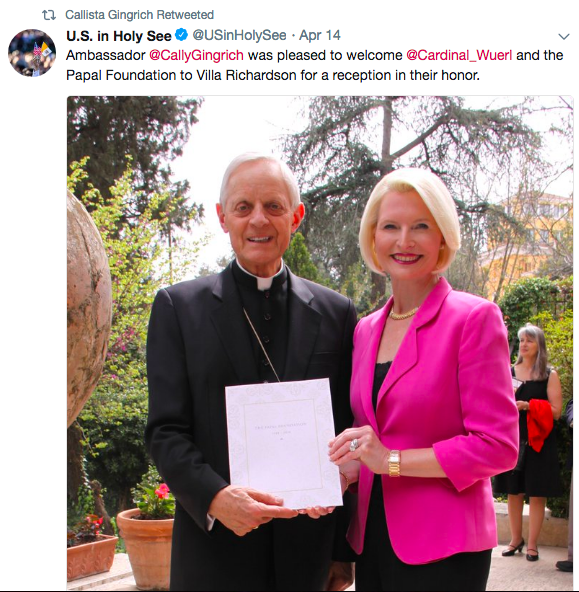 It goes without saying that ALL ambassadors to the Holy See should be vacating their respective embassies, with the American Ambassador leading the way since McCarrick and Wuerl are Americans. The current U.S. 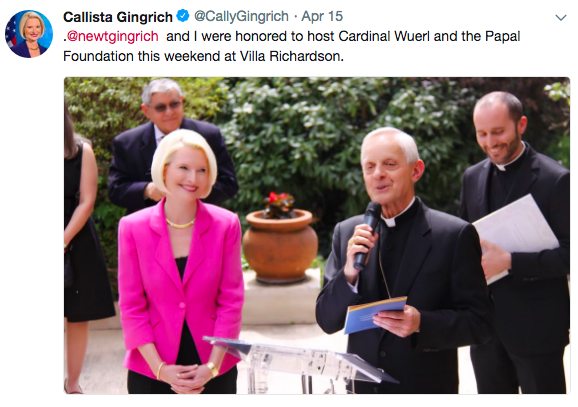 Ambassador to the Holy See is Callista Gingrich, in a post that Trump gave her (really, gave NEWT) in return for Newt Gingrich’s support during the 2016 campaign. Callista Gingrich is totally unqualified to do anything more complicated than selling Mary Kay Cosmetics (although she is quite possibly the single most terrifyingly PLASTIC looking woman I have ever seen, and I wouldn’t buy make-up from her if you paid me to take it), and her Ambassadorship is a complete joke. If you don’t believe me, watch her confirmation hearing. The woman is incapable of anything other than reading or reciting from memorization meaningless boilerplate platitudes and talking points, which is in direct opposition to Newt Gingrich, who is probably the best extemporaneous political speaker today. The guy can speak off the cuff brilliantly, you have to give him that. 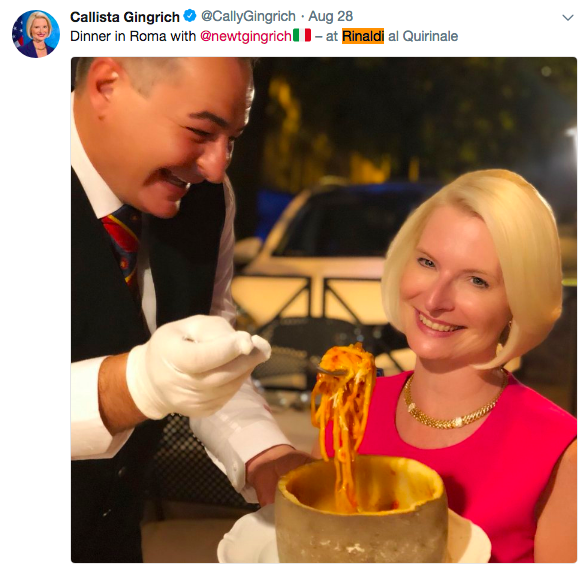 So all this ambassadorship is, is a political payment-in-kind by which Newtie and Callista get to live a life of decadent luxury in Rome, being feted at one nauseating elitist soiree and reception after another, hopping from fine-dining restaurant to fine-dining restuarant with all manner of social-climbing gutter slags and psychopaths kissing their asses, ALL ON THE TAXPAYER’S DIME. No need to dip into Newtie’s estate, PAC funds, or even take out a line of credit. Speaking of lines of credit, remember how during the ARSH 2012 election cycle when Newt ran in the primaries, that it was revealed that he had taken out a $250,000 line of credit with Tiffany & Co., the luxury jewelers? Because Callista WILL BE PROVIDED FOR. 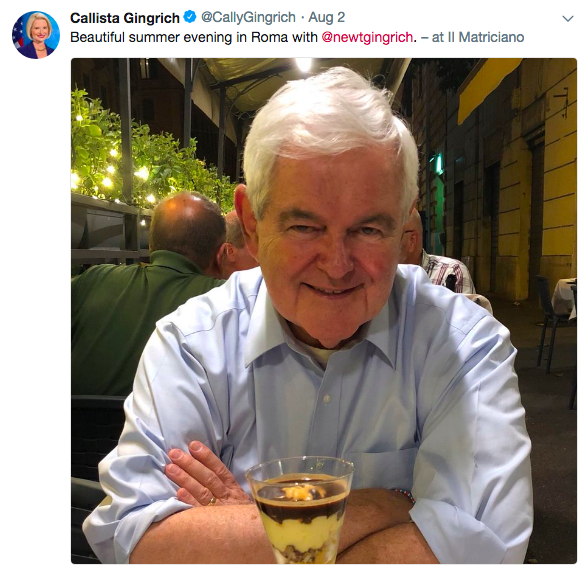 And remember how the death of the Gingrich Campaign was when, in the heat of the primaries, Newt and Callista totally went AWOL, only to be revealed as having gone off on a Mediterranean cruise at Callista’s insistence – without telling anyone on the Campaign staff where they were? Yeah. The vast majority of the Gingrich 2012 campaign staffers QUIT because of it. Because Callista MUST BE PROVIDED FOR. 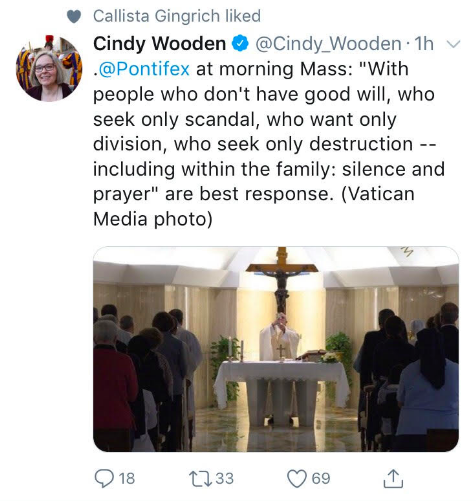 If you look closely at this Tweet by the odious Cindy Wooden, you will notice a couple of things. 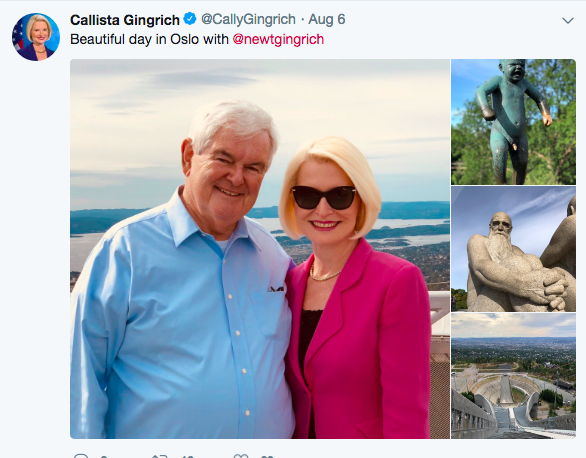 First, at the very top, “Callista Gingrich liked”. That infantile phrase is all you’re going to get out of Callista, and it’s all you need. Antipope Bergoglio himself has given them all the ultimate effeminacy pass – the silence of the despicable coward. Second, if you look at the picture, you will notice that Antipope Bergoglio has just consecrated the Precious Blood and is elevating the Chalice at his daily Mass. Look at the people. They’re all standing except for one nun in a white habit with black veil on the left side aisle. This is NOT something that should be discounted or ignored. These people hate God and categorically REFUSE to bend their knee to Him, and try to discourage others from kneeling before Him EVER. Evil, evil, evil, evil. I’ve noticed this is a HUGE thing with sodomites, in particular. I have personally been raged at by a sodomite, and I mean full teeth-bared hurling the f-word RAGED AT in public, because I kneel to receive the Eucharist. Folks, so-called “conservatives” are some of the worst in terms of using the Church as a racketeering front. Think about it. The big money is flowing not in Trad circles (Trads are poor, and there are only a few tens of thousands in the U.S.). Liberals are almost all apostates. 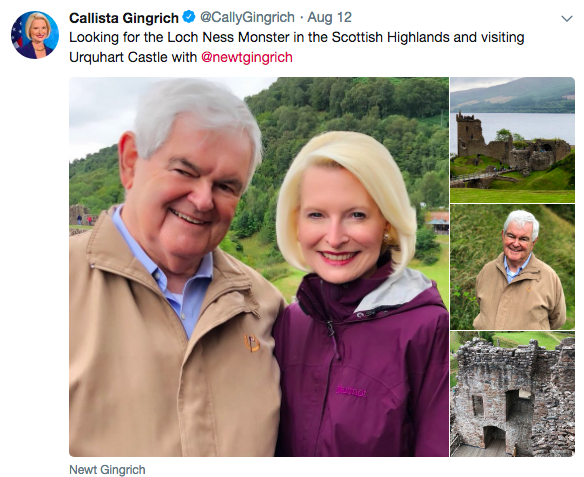 The big money in the Church to be extracted by white trash climbers like Gingrich are among the older, retired, right-center and neo-con contingent. THOSE are the people in their 60s, 70s and 80s who are total heretics, and contracepted their whole lives and aren’t sorry, and really don’t see why their super-cute hairdresser can’t marry his boyfriend and buy a pet human child, and whose 2.1 children are both divorced and “remarried”, and really just want those crazy anti-abortion nuts to shut up because between you, me and the fencepost, we really don’t want black and brown people breeding like rabbits. If you’re looking for integrity or the actual manifestation of Catholic belief out of a bunch of “conservative” grifters like Gingrich and Co., you’re gonna be waiting a while. Oh, and for all you Dignitatis Humanae fans out there (snorf), guess what Callista’s platform is? Yep. Religious Fweeeeedom. Not converting souls to Christ, and CERTAINLY not acknowledging Christ’s Sovereign Kingship. Oh, no. Religious Fweeeeeeeedom. Because error has rights, dammit! 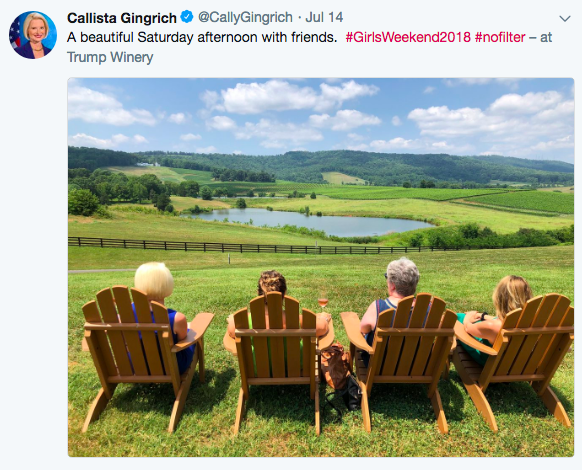 Here is just a little sample of photographic proof of the Callista Gingrich decadent life, all paid for by the taxpayer, INCLUDING THE VACATIONS, because all the Gingrich’s need do is show up at the Embassy of ANY NATION they choose to vacation in, and the whole thing becomes a “gubmit bidniss trip”. She will NEVER, EVER give this up.